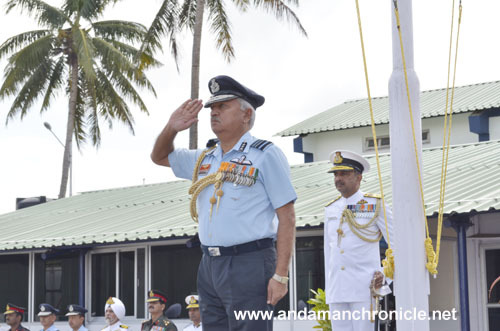 Port Blair, June 1: Air Marshal PK Roy, PVSM, AVSM, VM, VSM, ADC, Commander-in-Chief Andaman and Nicobar Command (CINCAN) bid adieu to the uniform on 31 May 14, after spending 39 years of distinguished service in the Armed Forces. Air Marshal PK Roy had taken over as the 11thCommander-in-Chief of Andaman & Nicobar Command on 02 Nov 2012. Under his Command, the ANC strove to play a pivotal role in safeguarding these Emerald Islands and their Air Space and Exclusive Economic Zone. With his stewardship, the Components travelled a long way in synergizing themselves for protection of these eastern frontiers of our nation, and in learning and adopting best practices from each other, while retaining individual core competencies, harmonizing all walks of professional lives and moving together onwards. The Air Marshal will be remembered for his determination in bringing the security and infrastructural requirements of the ANC into focus at the highest level. During his tenure, the Command witnessed several successful anti-poaching and human trafficking operations as part of coastal security, largest ever conglomeration of littoral Navies in the biennial mega event MILAN-2014, besides achieving high level of preparedness to deal with humanitarian assistance and disaster relief operations. The Command also witnessed several accretions to include induction of INS Saryu,INS Investigator, C-147, state of art Mi-17V5 in place of the ageing Mi-8 helicopters, Fast Interceptor Craft, Commissioning of ICGS Mayabunderand Kamrota. The maiden landings of C-17,Boeing P-8Iand C-130J aircraft and their effective ulilisation in the search operations for the missing Malaysia Airlines MH370 during Operation Search Light were also undertaken during his tenure. Air Marshall PK Roy also gave an impetus to public outreach and social welfare programmes. In support of the civil populace the Command was at the forefront in undertaking Search and Rescue Operations, rendering hyperbaric treatment to diving accident victims, evacuation of civilians stranded at remote islands during Cyclone Lehar and conducting multi-speciality medical camps in various outlying islands. As part of his farewell visits, he visited the Army,Navy, Air Force and Coast Guard Component including various outlying detachments and stations, and reviewed the operational and infrastructural enhancements made during his tenure. The Air Marshal and MrsRanjna Roy, President Defence Wives Welfare Association, interacted with all ranks and families of the various Components during the functions organised by them. Mrs Ranjna Roy was given a farewell by the Defence Wives Welfare Association. Air Marshal PK Roy, PVSM, AVSM, VM, VSM, ADC, was commissioned in the Indian Air Force on 11 Jul 1975.He is a qualified Flying Instructor and has instructed cadets at Air Force Academy and Helicopter Training School.The important appointments held by him include the Command of a Helicopter Unit, Station Commander of Air Force Station, Thoise and Air Officer Commanding, Air Force Station New Delhi. He has also held the appointments of Senior Officer in charge Administration at HQ Eastern Air Command and Assistant Chief of Air Staff (Personnel Airmen and Civilians) at Air Headquarters. On promotion to the rank of Air Marshal he was appointed as the Commandant of National Defence College on 01 Jan 2011. The Air Marshal has also served as the Military and Air Attache` in the Indian Embassy at Ukraine with accreditation to Romania from 2002 to 2005. He is a graduate of Defence Services Staff College, Wellington, Higher Air Command Course at College of Air Warfare, Secunderabad and an alumni of National Defence College, New Delhi. For his distinguished service of an exceptionally high order, he was awarded Vayu Sena Medal, Vishist Seva Medal, Ati Vishist Seva Medal and Param Vishist Seva Medal in the Republic Day Honour List of 1995, 2005, 2007 and 2014 respectively. He has also been the Honorary Air Aide de Camp to the Hon’ble President of India. The CINCAN addressed all ranks of the Command on 30 May 14, in which he appreciated the work done by all ranks during his tenure and urged all to continue to uphold the spirit of jointmanship as the Command marches on to achieve ‘Victory through Jointness’. He also highlighted upon the fragile ecology of these pristine isles andstressed that the Command should remain committed to environmental issues and local sentiments while undertaking the security developments in the region. 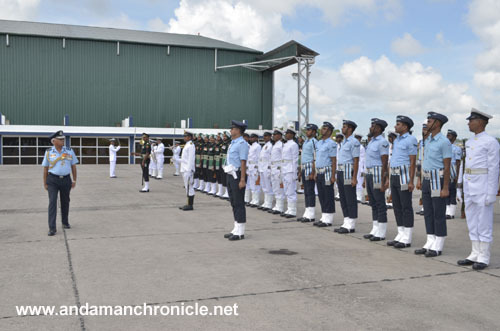 The CINCAN was accorded a Ceremonial Guard of Honour at INS Utkrosh on 31 May 14. Air Marshal PK Roy PVSM, AVSM, VM, VSM, ADC Commander in Chief Andaman & Nicobar Command and MrsRanjna Roy, President Defence Wives Welfare Association depart for New Delhi on 01 Jun 14. The void left behind by the Air Marshal and Mrs Ranjna Roy will be difficult to fill up, stated Col Harmit Singh, Command PRO in a press communiqué received here.